With 20 years of production creeping dangerously close to one million units (855,000 at last count), and a claimed 178 awards under its belt, the world’s best-selling open-top two-seater has plenty of reasons to smile. But the facelifted third-genner cracks a Botox grin like it’s rocked in the door at 6am after a night of dance-party tomfoolery. Or woken up and found Jennifer Hawkins cooking it breakfast. Or perhaps both. With 20 years of production creeping dangerously close to one million units (855,000 at last count), and a claimed 178 awards under its belt, the world’s best-selling open-top two-seater has plenty of reasons to smile. But the facelifted third-genner cracks a Botox grin like it’s rocked in the door at 6am after a night of dance-party tomfoolery. Or woken up and found Jennifer Hawkins cooking it breakfast. Or perhaps both. Sure, there are subtle nips and tucks: a trimmer rump, more shapely side-sills, a bit of fender massaging and minor plastic surgery to the lights and wing mirrors. But it’s the new five-point grille and triangular fog-lamp bezels that certainly nails the brand’s current styling language, and makes the old car’s face look a bit blank. Mazda calls it “aggressive” – we reckon it’s a promise of the kind of black-labelled, X-rated, over-proof fun you might need lawyers to bail you out of. Never has MX-5 appeared so keen to be naughty. So you might, then, take a cursory glance at the muscle-shirt wearing MX-5’s new glory figures, and the mechanical specs behind them, and think it’s a bit of a farce. Little, it seems, has changed over the old car. The previous hard-lid Roadster Coupe scrambled over the 400-metre mark in a commendable 15.8sec. The new range-topping Roadster Coupe Sports – featuring BBS 17s and suede/leather mix Recaro buckets – shaves just a single tenth off that, yet at $51,455 (for the manual) it costs $3795 more. 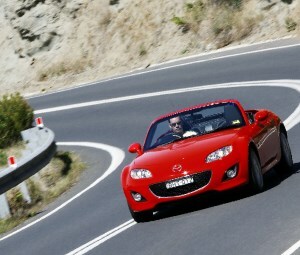 The old MX-5 weighed 1152 kilos whereas the new hero model carts around an extra 15 kegs (the base soft-top is 1129kg). And there are no major chassis, suspension or driveline overhauls. Then there’s the engine. At 118kW and 188Nm, the new MX-5’s 2.0-litre four-banger makes exactly the same outputs as before. That’s a big head-scratcher, you might think, given the introduction of a forged crankshaft and revised full-floating pistons, conrod bearings and valvetrain gear. Net gain? Peak power, for the manual version at least, is 300rpm higher, and the (7500rpm) rev-limiter cuts in 500rpm higher. “Big whoop,” you might say. In-fact, the most conspicuous addition to the engine bay is the ISE, or Induction Sound Enhancer – a device that sort of amplifies the induction noise into the cabin via plastic ducting in the dash panel. But to measure a new MX-5’s worth in the size of its net gains misses the point. It’s of the rare motoring breed that is, like Porsche’s 911 Carrera, a much-loved and successful formula honed to a level of brilliance over generations. And where, engineering- and design-wise, significant effort goes into each successor in tuning and polishing the detail work to a level of perfection. For open-top sportster ability and driver enjoyment, the old car was peerless. So Mazda’s goal with the facelift was more of the same where it could, while chasing more refinement and comfort and, conversely, creating a sportier-feeling and more abuse-proof result. Apply the methodology to MX-5’s engine and you get a silky smooth, hard-revving, absolutely bomb-proof unit that’s surprisingly eager (given the output) from the depths of the rev-range – it’s toey around town – to the manual’s extended banshee-wailing 7500rpm cut-out so handy for holding a selected gear through racetrack curves. It’s refined, yet has a nice raspy edge, audible without being annoying. It’s punchy enough to fry the tyres, but has that linear flexibility so crucial to MX-5’s fluid balance. And it’s claimed that fuel economy has improved six percent, now 8.1L/100km. It’s a gem, and you sense that significant effort has gone into achieving the excellent end result. The Activematic six-speed auto models cop a different engine tuning – the same 118kW peak comes in at 6700rpm, 300rpm lower than the manuals, though torque remains the same, 188Nm at 5000rpm. From the base soft-top ($43,850) to our full monty Roadster Coupe Sports test car, all manuals get an LSD, while the autos (Touring, Coupe and Coupe Sports only) don’t. Though Takao Kijima, the MX-5 Godfather himself who tagged along to the local launch, claims the auto “isn’t really the sporting version”, the Activematic is a gem: completely fluid with intuitive sport-focused shifting and a tight ratio spread. It’s superbly mannered around town – all in a single mode – and offers a new, instantaneous manual mode at a flick of the correctly arranged (– forward/+ back) console shifter or the awkward thumb (–) and finger (+) tiller paddles that are mounted to the steering wheel. The revised six-speed manual, with more robust syncros, feels as direct, tightly gated and as nicely ‘mechanical’ as ever. The super-rigid structure – some 58 percent of the ‘body in white’ is high- and ultra-high-tensile steel – and perfect 50/50 weight distribution are carry-over, but the suspension has been retuned (revised front geometry, settings altered all round) and the front roll-centre has been lowered by 26mm to improve the old car’s already excellent steering response, which Mazda claims is now more linear. Tangibly, though, it feels fractionally sharper in tiller response and a little busier around the dead-ahead position, while the front-end feels noticeably more eager on initial turn-in – being almost a touch too aggressive in its want to point the nose at an apex. Steering weight remains nice and meaty, too. The MX-5 is still as joyfully responsive and grab-its-scruff playful as ever. It hasn’t lost that keenly intimate communication between the tyres and road surface, fed through the thick-rimmed tiller and the snug, yet not overly bolstered, leather/Alcantara mix Recaros (everything bar the range-topper gets traditional, more relaxed-shaped Mazda buckets). But perhaps MX-5’s most impressive trick is how it retains such a crisp sharpness to its body control while offering a really startling level of ride comfort. The spring/damper matching and compression/rebound rates offer suspension tuning par excellence. There’s a slight jiggliness at low speed, but get moving and every road pimple is ironed smooth, and every hard-edged hole or dramatic bump is cushioned with a controlled perfection many large and heavy cars can’t match. Yet it never stops feeling nimble and sporty, anywhere, and is downright tenacious when asked to change direction in a fast sequence of corners. The 205mm-wide rubber still looks anaemic under MX-5’s pumped guards, and those frankly Wheel-And-Tyre-Mart-looking 17-inch BBS rims don’t do it any favours (the standard wheels are much nicer). But they muster up decent lateral grip, and break away nice and progressively at the sort of brisk road speeds where most keen punters might ideally want to do a bit of lateral tango with the sublimely balanced chassis’ rear-end. One button switches both electronic stability- and traction-control systems off, and there’s enough slip-angle and headroom tuned into both to have a hard punt without either waving a white flag in protest. We’re not completely sold on the Roadster Coupe’s looks, though. The hard skid-lid’s a bit bulbous for MX-5’s proportions, a bit Noddy Goes To Toytown. But it opens or closes electrically in 12 seconds, robs no boot space, removes a lot of ambient noise when shut and adds just 37 kilos over the more pleasant-looking soft-top. It’s quieter than the old coupe, too, and the model’s front suspension crossmember is urethane-filled to reduce in-cabin road noise. In-fact, bar some occasionally hellacious tyre roar, it’s quiet, refined and completely unfatiguing to drive on long distances. Too refined, some MX-5 diehards argue, including a couple of MX-5 club members Mazda brought along to the local launch, early-girl NA and NB models in tow. Does being Spartan mean purity for the MX-5 breed? Judging by the new range’s impressive specs, definitely not. Standard equipment, even on the base soft-top, includes cruise control, six-disc stereo, electric windows/mirrors, central locking, front and side airbags, DSC and traction control, and all variants feels a bit richer and nicer inside. At mid-spec Touring level, trim is leather and the stereo is a new 200W seven-speaker Bose system. There are even a few new and clever cabin storage tricks – like the centre console ‘grip’ mat or new door-mounted storage nets – and, for some reason, four cup holders (in a two-seater?). Take two of the third-gen MX-5 proves that you don’t have to rough it (hello Lotus) or even be a masochist (that’s you, Elfin and Caterham) to enjoy a bona-fide, lightweight, two-seat sports-car experience. Then again, some may argue that the MX-5 has nothing to prove. And in continuing along a proven path with steady incremental gains while offering plenty of choice – there are seven versions available, priced between $43,850 and $53,655 – the MX-5 looks to continue its status as both a credible enthusiast cult car and a reasonable volume-seller fit for the masses. And that’s a rare path to forge indeed.